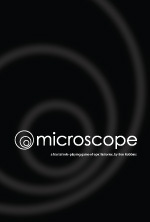 LL recently picked up a couple copies of the Microscope RPG from Lame Mage Productions. I had heard of the game previously but have to admit that I had been a bit baffled by the concept behind what designer Ben Robbins bills as “a fractal role-playing game of epic histories”. That confusion ended on Monday when LL and I sat down to experiment with it for a few hours…though, I suspect, we barely scratched the surface of what this thing can do. 1) Big picture – Players discuss and come up with a sentence overview that defines the history you want to examine in the game. It can be anything, really, but specific is good. 2) Bookend History – Define the starting and ending periods of your history. You also decide whether these periods are “light” or “dark”. 3) Palette – Decide what elements will be allowed in the game. Players take turns adding items to the “yes” and “no” columns of your “palette”. You only need to add something if it would be expected and you don’t want it (e.g. wizards in a fantasy history) or if it wouldn’t and you do (e.g. nanotechnology in a fantasy history). Adding “No FTL travel” to a history covering interstellar civilization will, obviously, change the nature of your history. The elements in the palette must be agreed upon by all of the players. 4) First pass – Each player adds one new item to the history to kick off the game. These can be “periods” or “events”, which I’ll describe in a bit. After those steps you start playing the game in turns. Microscope uses notecards to record your history. The starting and ending bookend periods are each summarized on a notecard, oriented vertically, and placed on either end of the play area. As play proceeds, new periods are summarized on notecards, also oriented vertically, and inserted into the timeline as desired. Players can also create events that drill into things that happened during a specific period. Events are summarized on notecards and placed horizontally beneath the period in which they occur. The final level of detail players can add are called “scenes”, which seek to answer a specific question about the history that took place during a given event. Scenes are summarized on a vertically oriented notecard and placed under the event in which they occur. The first player takes the role of the “lens”, defining the current “focus” or specific element in your history to be explored in this turn. The player writes down the focus and her name on a notecard. The focus could be a person, place, thing, event, or something else. All history created during this turn should be related to that focus. After the focus is established, the lens creates a period, event, or scene that explores that focus further – actually, she can create two elements of the history as long as they’re nested (i.e. a period and an event within that period or an event and a scene within that event). Then the other players each create one period, event, or scene that also explores the focus. Finally, the lens wraps it up by creating another element of history (or two nested elements) about the focus. Each player takes turns acting as the lens, defining a focus for the history created on their turn. Periods and events are dictated by the player that creates them, within the boundaries established by the palette and established history. Scenes are a little different. They can be dictated or played out as a role-playing vignette, according to the wishes of the player that creates the scene. If played out, the creator establishes the question to be answered, the setting in which the scene takes place, and required or banned characters. Then each of the players takes on a role and they play out the scene until the question is answered. A final bit of the game I’ve left off so far is “legacies”, which are created between changing focuses. After one lens is done the player to his right chooses something from the history just created to become a legacy and then establishes another historical element related to that legacy (or another legacy that already exists). This gives the opportunity to highlight some key person, place, thing, event, etc. as historically significant and explore it further without the limitation of the focus. The rulebook makes it all much clearer than I can here, of course, all in a sensible 80 pages. Go get it. Really. In the meantime, LL and I will try to play a real session of the game next Monday and I’ll post the results here. Period: A “superflu” virus emerges. Event: Meyer steals and releases superflu virus. Scene: Why did Meyer release the virus. Period: Postapocalyptic civilization reaches new heights. I only got partway through the first turn of the game. The current focus is Colonel John Meyer, so the next player would now add another historical element related to him. It could be more exploration of his role in the release and spread of the virus…or it could be Meyer reappearing later in the history as a survivor. Day 14 – Boarding school. Day 15 – Another day, another…turtle? Shiera caught a bunch of turtles today and, because Kroop was again insensibly drunk, cooked them for dinner. It was edible. Day 16 – Are we there yet? Valana did a commendably good job of fixing a broken hatch. Keeya tried to hypnotize Tate but it didn’t work well. Our friends’ relations with Maheem are static. Apparently he doesn’t like much of anybody on the crew and wants to stay as far away from the troublesome newcomers as possible. Shiera is becoming a passable cook…after a great deal of evening practice. The turtle soup tonight was pretty good. Day 17 – Unpleasant duties. Our friends have begun to notice that they’re ending up with the worst duties on the ship. They usually find themselves using the holy stone on the deck (murder on the hands), pumping out and swabbing the bilges, and catching rats. Master Scourge spends a lot of time whispering to other crewmen and it’s pretty clear at this point that he’s actively countering their efforts to make friends aboard Wormwood. Day 18 – Go away kid, ya bother me. Killian decides to use the direct approach with Scourge. He approaches and makes a case for the newcomers, highlighting how diligently they’ve done their jobs, their efforts to improve crew morale, and so on. Scourge seems little moved and tells Killian to get out of his face. Day 19 – The bilges. Perhaps Killians efforts the previous day had some effect, as he received a better job than he had for the last few days. Valana, on the other hand, was sent to work in the bilges, along with Jaundiced Jape and Tate. On her way down, she was stopped by Mister Plugg, who had been informed that she might be armed. She handed over her dagger and went to work. In the bilges, she was soon accused by Jape of slacking off and the two began to brawl. Jape pulled a dagger and Tate jumped into the fight. Valana had given up her dagger, but not her brass knuckles, which she slipped on when harsh words began to fly. She pounded the two men into unconsciousness and then went up to report the incident. Plugg and Scourge investigated and returned with grim looks. They reported that Jape had been killed, drowned in the bilgewater. Scourge ordered Valana locked in the sweatbox to await Captain Harrigan’s judgment at Bloody Hour that evening. When the time came, she was brought forth and the captain produced a scroll and read from it, “Valana: You stand guilty of murdering a fellow crewman and are hereby sentenced to keelhauling, to be carried out at noon tomorrow. Let this be a lesson to you!” She was placed again in the sweatbox to await her doom. Day 20 – Sails on the horizon! The next morning, shortly after the remains of the biscuit were put away and the crew had taken their posts, Keeya on lookout saw the distant white smudge of a ship’s sails. She eyed it for a moment, noted its flag, and called out, “Ship ahoy! Rahadoumi merchant. Looks like she’s loaded!” Mister Plugg and Captain Harrigan conferred for a moment and he gave the order to alter course to intercept. With the wind at their back, and some luck, they’d be on the slower merchant ship by morning! Day 11 – Trouble in the sun. Today the Promise passed quite near the Slithering Coast. The sun was bright and the water clear. As the ship passed an area of beautiful reefs Mister Plugg tasked some of our friends, and Slippery Syl, with going for a swim to catch some crabs for dinner. Since Keeya wasn’t a great swimmer, she convinced Plugg to let them take the ship’s boat. They rowed several hundred yards to a likely spot and did some diving. As they were grabbing crabs for their pots, however, one of the crabs grabbed back. A fierce reefclaw latched onto Killian and drew blood. 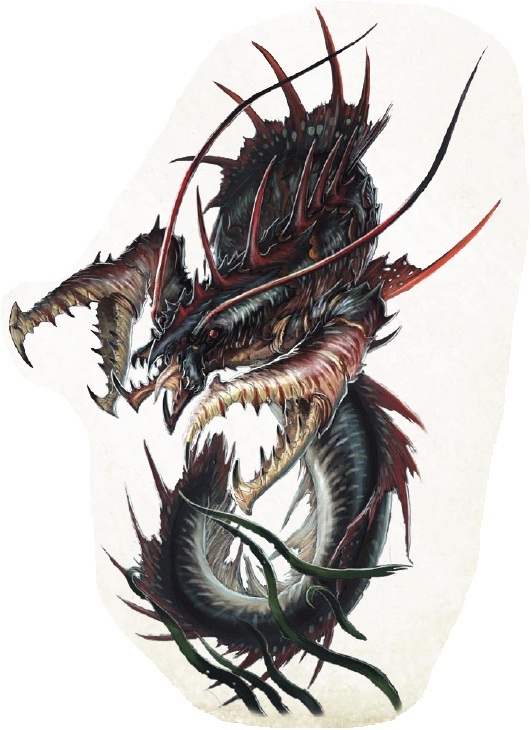 Valana and the others tried to help and eventually managed to kill the monstrous crab and one other that had menaced them. They threw them into their crab pots and called it a day, though Killian did require some patching up by Shiera. (MA: Actually, he almost died!) Captain Harrigan was *very* glad to find out about the reefclaws, they’re apparently a Garundian delicacy, and gave Killian a potion to soothe his hurts. That night, after a fine meal of crabs, Killian told a story about reefclaws, providing some entertainment for the crew. By now the days aboard Wormwood were beginning to blend somewhat for our new friends. Valana and Killian did their jobs very well, while Keeya and Shiera did less well. Baroque broke something or other while cleaning the deck and got a rope bash for his incompetence. The only true excitement of the day, however, came during the drawing of the evening’s rum ration. Shiera, purifiying an ever-growing number of cups of the stuff for their friends, had a hard time hiding what she was doing. Mister Plug noticed her saying prayers over the rum and confronted her about it. She sold a story about the blessings of Besmara and Plugg, amazingly, bought it. Day 13 – Can I get some of that too? Another day another…what? Shiera cooked a great meal today and the crew quite enjoyed it. Sated and in a good mood, Mister Plugg asked Shiera if he could try a cup of Besmara’s Blessed Rum. She obliged him. We don’t know if he felt better than normal the next day or not. More reports from the Wormwood still to come. The red sky this morning bore ill tidings. A storm loomed on the horizon and the crew prepared for the worst as the rains began to sweep the deck. Keeya, on lookout, failed to notice a large chunk of flotsam, likely churned out of the storm ahead, floating under the waves and it pounded into he hull but caused no damage. Shiera caught a few turtles, which Kroop cooked for dinner…taken belowdecks tonight due to the inclement weather. Later that evening, Shiera worked on her cooking skills. She and Valana both felt much better, the last of the ill effects of their rat bites finally abating. Day 8 – The storm! By dawn the storm was upon Wormwood and all crew were called to their stations to keep the ship afloat and on course. They worked double shifts. After her failure the previous day, Keeya was placed on repairs and rope duties. Shiera took over lookout duties during the day, not that there was much to see other than the massive waves threatening to capsize the ship, and Valana covered the second shift. Shiera did well but Valana missed seeing a huge piece a flotsam, the former figurehead of a ship lost in the storm. It collided with the foreward hull, port side, ripping a large hole there (fortunately well above the waterline!) Sometime during the second shift someone shouted “Man overboard!” and available crew rushed to the rails to see who it was and help if they could. It was Crimson Cogward, one of our group’s new friends. Killian sprang into action, tossing the flailing sailor a line, and the crew was able to pull Cog back onboard quickly. By the end of the day the crew was exhausted and took to their hammocks as soon as the storm died down. Day 9 – There’s always a silver lining. Today Valana and Baroque were assigned to repair the gash in the hull. 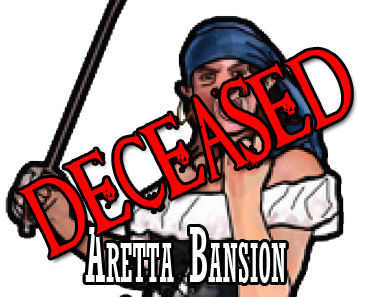 Aretta Bansion was an unwelcome addition to their work party. Before they had gotten very far with the job, Valana had goaded Aretta into a fight. Baroque and Valana jumped on Aretta and pounded her mercilessly. Aretta, having gotten enough of the short end of the stick, pulled a blade. Her fate was already decided, however. Valana knocked her unconscious and then, in a snap decision, asked Baroque to help pick the woman up. They maneuvered her to the breach and tossed her out, Aretta’s body slipping quickly under Wormwood’s hull. After a suitable wait they went up on deck and gave the “man overboard” warning. 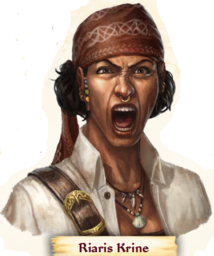 Crew ran to the rails but Aretta was nowhere to be seen…except by Keeya, again on lookout, who spotted Aretta’s blue scarf well aft of the ship but said nothing. Well, that’s what I call sailors behaving badly. Not nice at all. More reports from the Wormwood still to come. Life was becoming routine aboard the Wormwood, as the new crewmembers tried to do their duties and win friends among the surly crew. Keeya was assigned to mend sails with “Barefoot” Sams Toppin. She tried to make a connection with the former fisherwoman but utterly failed. Shiera tried her hand at fishing, and caught more than enough for the evening meal. 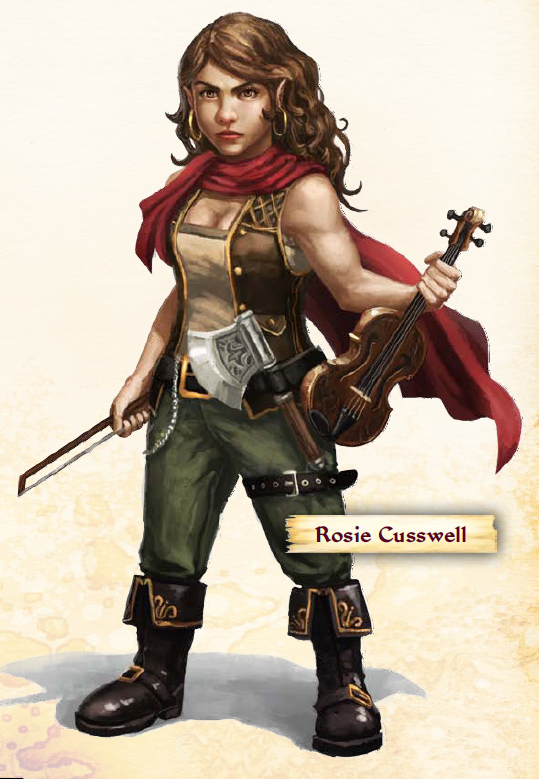 She also found Kroop and Cut-throat Grok playing drinking games in the galley and taking turns on Rosie’s purloined fiddle. When they were well into their cups she swiped it and returned it to immense gratitude of the foul-mouthed halfling. Killian cheated a little at his deck-swabbing duties. Using the “holy stone” seemed a bit too much like work so he took the day easy and used prestidigitation to shine up the deck when nobody was looking. Valana kept her eye on the crew, sussing out attitudes and extant alliances among them. She gathered a fair bit on intel to share with her friends. Finally, Baroque was on repair duty. He did a fairly miserable job reattaching one of the heavy bronze kraken heads to the spokes on the wheel…causing it to fall onto the toe of the officer making a course correction. Toward the end of the day, little Jack Scrimshaw ran onto the deck and reported to Mister Plugg that something had nearly bit him in the bilges. Plugg sent some “volunteers” down to check it out. He chose, of course, the newest crewmembers for the job. Down in the stinking waters of the bilges, they saw something swimming in the shadows and moved to check it out. Turned out to be the biggest rat they’d ever seen…soon joined by more vermin companions. Valana and Shiera were bitten by the filthy beasts and one somehow leapt from the water and took a nasty gash out of Baroque’s face (MA: Confirmed crit. Ouch!) before they had them all on skewers. They brought the carcasses back for Plugg’s examination and he pronounced it a job well done. That evening, as Shiera was preparing to purify the rum, they noticed Aretta paying particularly close attention to their activity. Killian launched into a song about shipboard rats and exterminating them, with Rosie playing backup on her newly returned fiddle, and Concho playing the fool…imitating stabbed, strangled, and stomped rats. It was a good show, sufficiently distracting that none of the crew noticed Shiera’s hijinks with the rum. Later that night, Killian tried to capitalize on the crew’s elevated mood by trying to charm Fipps Chumlett a bit. He utterly failed, inadvertently insulting the obese sailor’s with a playful comment about his immense girth. Luckily Shiera was able to smooth things over somewhat by slipping Fipps a little extra grilled ahi. Day 5 – The Owl Bear. Today Keeya caught Aretta Bansion unawares. The former harlot was on rat-catching duty and had just ducked down behind some crates on deck to ferret out one of the nasty buggers. Keeya cast sleep and Aretta curled up in the warm morning sun for a little nap. She might have been okay, except that Keeya then caught Plugg’s attention to discuss a problem with the upper rigging and they “just happened” to walk by the sleeping sailor. Aretta was awakened with a hard kick and told she would receive lashes during the Bloody Hour. Baroque, serving as runner, knocked a bucket of washwater right onto a valuable chart and spent the rest of the day cleaning and drying it in the sun. Shiera brought Fipps some more extra rations and Killian, after easily completing his ropework duties, worked a little on Tam “Narwal” Tate, a surly dwarf. Valana had less luck making nice with Maheem, accidentally making some subtle insult about his tribe…well all Mwangi, actually. Day 6 – Just getting by. Our friends performed their jobs only adequately today. Shiera and Valana, had some excuse, having been feeling a bit ill due to an infection from the rat bites they received in the bilges on day four. Shiera cleaned and dressed their wounds and applied an old Mwangi medicine-woman balm (foul-smelling stuff) that seemed to help somewhat. Kroop was insensibly drunk today so Shiera was on her own with fishing and cooking. She caught plenty but the preparation was somewhat lacking. Valana and Killian mostly took work light and both spent some time with Shivikah. Amazingly, Killian knew a couple of songs from her homeland and sang them well, cheering the homesick Mwangi a bit. Shiera saved aside a couple of fish for Fipps, again earning the big man’s gratitude. Later that night, after dinner, Killian had a talk with Slippery Syl and she seemed to be becoming more friendly to the group, and less so toward Aretta. That’s it for now. Stay tuned for more.